Senator Edward M. Kennedy&apos;s car the day after it crashed, killing Mary Jo Kopechne, July 19, 1969. The image of Teddy Kennedy that the movie “Chappaquiddick” presents is of an immature yet calculating man who chose to hold onto his life as a politician, rather than resign, because it was the only one he knew. That certainly was the image that emerged from the news articles and TV reports that reporters like myself gave during the weeklong coverage of Kennedy’s automobile accident, in July 1969, in which a young female campaign worker was killed. Despite the torrent of questions about his conduct during the fateful night of the accident and his presence at a late-night party before it — where all the men were married and unaccompanied by their wives, and all the women were single — Kennedy remained secluded with his lawyers and political cronies at the Kennedy compound in Hyannis. Out of that Hyannis bunker, the lawyers and aides connected with the Bristol County district attorney’s office to keep abreast of the investigation as well as the other party-goers so nothing negative would be said about what had gone on at the party. The official line held: There hadn’t been that much drinking at the party; in fact, the senator had only one or two of his favorite rum-and-cokes before leaving with Mary Jo Kopechne. Yet reporters at the scene were being told that a large trash can filled with empty beer cans and liquor bottles was carted away from the Chappaquiddick cottage the next morning. And while Kennedy’s handlers had made sure that Kopechne’s body had been flown off the island before an autopsy could be conducted, a blood sample had been taken, and it showed that she was slightly under the legal limit for drunk driving. I had gained the scoop on the blood sample from the county medical examiner, who had willingly provided me the information when I knocked on the front door of his home on the Sunday afternoon I arrived on the island. But it wasn’t my law school training that sent me to his door to seek out the information — but rather the detailed understanding that the Globe’s weekend city editor had of how local police departments handle crimes, whether petty in nature or as earth-shattering as this one. Five years later, I was one of three members of the Globe Spotlight Team who conducted the first interview with Kennedy on his actions at Chappaquiddick. Globe editor Tom Winship had determined that, as New England’s newspaper of record, the Globe should, if it was going to criticize Richard Nixon on Watergate, make a thorough journalistic review of Kennedy’s conduct at Chappaquiddick. The criminal case against Kennedy was over — he had pleaded guilty to a single count of leaving the scene of an accident — as was the closed-door inquest in which he and others at the party had testified. A grand jury had considered the inquest record and taken testimony as well and decided to return no indictments. A fair reading of the case showed that the evidence did not justify bringing tougher charges such as driving to endanger, or even manslaughter. But by leaving the prosecution in the hands of a politically-savvy Democratic loyalist ensured that unanswered questions were not pursued, and it also ensured that those questions would persist through the years. Although Kennedy began our interview by acknowledging that his actions that night of the accident were “irrational and indefensible and inexcusable and inexplicable,” he seemed hesitant and ill-at-ease throughout. When asked about his conduct just before and after the accident, he declined to answer the questions spontaneously and referred instead to the testimony that he had given at the 1970 district court inquest, reading those responses word for word. He declined our request to urge the others who had attended the party or those whom he had consulted with in Hyannis for legal and political advice to give interviews with us. Although Damore’s book is not mentioned in the film’s credits, it along with court records appear to have been the sources for an integral component in its narrative — the split between Kennedy and Gargan over what he should say in his televised address after pleading guilty in court. While Kennedy was able to show true remorse and apologize for the death he had caused, he declined to follow the path that Gargan had urged on him for redemption: resign from public office. Instead, Kennedy chose the politically expedient route and called on the Massachusetts voters to let him know with phone calls and letters as to whether he should resign his Senate seat. In the Commonwealth of Massachusetts, which had never denied a Kennedy’s bid for public office, he knew it was a safe bet. 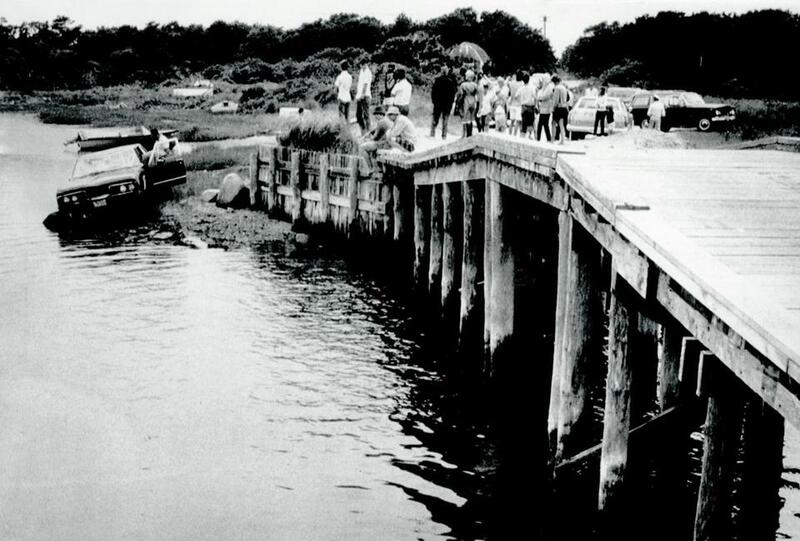 But if the negative image that the film projects of Kennedy’s actions at Chappaquiddick is based on solid reporting, that it fails to reconcile that image with the extraordinary public life he led following the accident is unfair. While the final credits inform us that Kennedy failed in his only bid for the presidency, in 1980, left to a fast-paced murmur are the extraordinary legislative achievements that marked his years in the Senate and earned the title Lion of the Senate before his death, in 2009. Among them are health care and education reform; the Family Leave Act; abolishing national immigration quotas; the Americans with Disabilities Act; the National Cancer Act, and the Mental Health Parity Act. Taken together, they show that Kennedy certainly found purpose by staying in public life, and that the country was well-served by that decision. Stephen Kurkjian was a member of the Globe staff for 40 years. He was a founding member of the Globe Spotlight Team and served as chief of the Washington bureau. He can be reached at Stephen@stephenkurkjian.com.